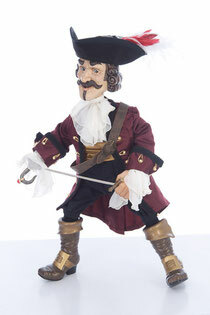 Captain Hook stands 24” and is dressed in natural fibre fabrics and with a hat any pirate would be proud of. He comes with a sword and a beautiful ring on his hook. Captain Hook is limited to 175 pieces worldwide. 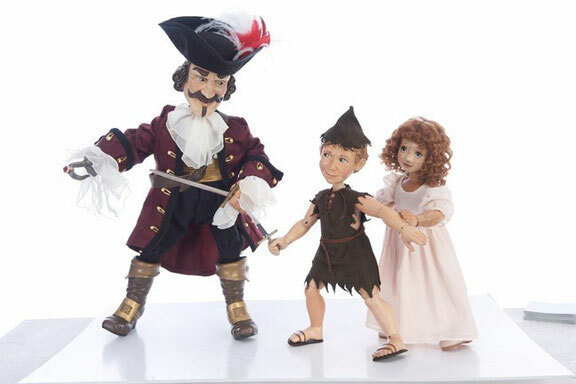 Peter Pan stands 17” and is dressed in a leather tunic, shorts and hat. He comes with a small dagger that he carries at his waist. Peter Pan is limited to 225 pieces worldwide. 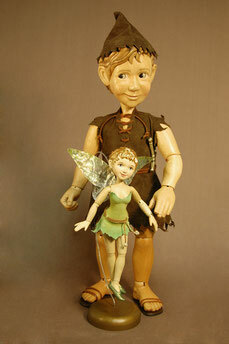 Tinkerbell is 9″ tall and fully carved from wood with 13 moveable joints. 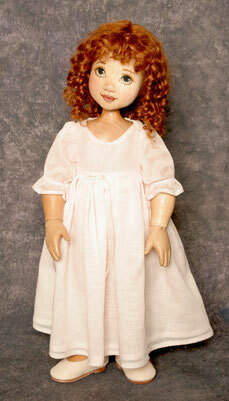 Her face, hair and shoes are hand painted with intricate details. Her costume is made from soft suede leather laced up the back with a tiny leather suede belt. She has a specially designed stand, which allows her to be suspended in mid air. Tinkerbell is currently SOLD OUT. Please contact us to order.